Ian Lebby discusses Mercedes Xentry with attendees of WORLDPAC’s first supplier and training expo. The expo featured dozens of classes on topics covering a number of import makes and models. Lebby’s class focused not only on Xentry tips, but also SCN coding, CAN basics and networking management, SDscan introduction, theft-relevant parts info and models covered. 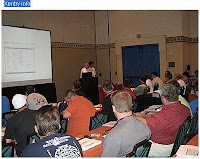 WORLDPAC’s Supplier & Training EXPO provided guests with a completely customized weekend of exclusive technical and business training specifically designed to increase the future success of their independent repair business. The event hosted over 500 import specialists from 43 US states and Canada, over 50 leading suppliers including tool and equipment manufacturers and over 30 of the industry’s most respected training instructors.